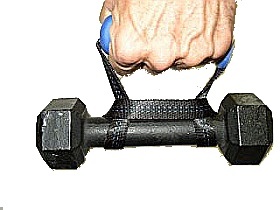 Attach the e3 Cable Resistance Grips (CRGs) to a cable resistance system such as Bowflex®, Total Gym®, Pilates equipment, or the cable system in your gym to replace the standard cable grips or bars. 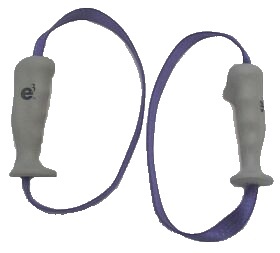 The e3 Cable Resistance Grips help stabilize the shoulder during use which allows for greater isolation of the biceps, deltoids, triceps, pecs, and abs. This will allow you to get more out of your workout in less time. During bicep curls and rows trapezius pressure is greatly reduced, and bicep and abdominal recruitment is noticeably increased. We also offer the CRGs in a version with slightly longer webbing loops, XtraLong CRGs, which permit their use with dumbells and weight bars by looping the webbing around the bar as seen at the left. Normally we ship e3 Cable Resistance Grips in random colors based on stock availability. If you have an absolute preference for a grip/webbing color combination or wish to convey "please don't send purple grips with blue webbing", please do so in one of the comment boxes on the order form when you get to the shopping cart. The XtraLong CRGs can also be used with cable and other equipment - same as the regular CRG's. Our 30 day satisfaction guarantee allows you to try it for yourself. We normally ship e3 Cable Resistance Grips in colors depending on stock availability. If you have an absolute preference for a grip/webbing color combination or a "please don't send green grips with blue webbing" message, please do so in one of the comment boxes on the order form when you get to the shopping cart. We can not guarantee that we will be able to fully comply with your color request, but will try to do so, or come as close as possible.